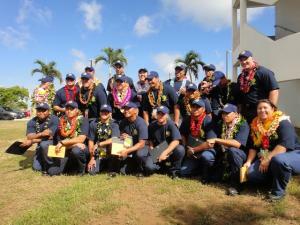 Honolulu's class of 2012 FIRE recruits. HONOLULU – On Friday, May 10th, the Fire and Environmental Emergency Response (FIRE) Program at Honolulu Community College will hold its Firefighter-1 Recruit Academy Certification Ceremony entitled ‘The Dragon Slayers’. Nineteen (19) trainees will graduate as fully trained and certified level 1 firefighters completing their capstone Firefighter-1 course in their final semester, a 16 credit course with two components that consist of an on-line virtual classroom experience to develop cognitive knowledge and competency-based skills training and testing to National Fire Protection Association standards. “As a former federal fire trainer, it is critical that FIRE recruits from Honolulu Community College have the foundational skills and theory for the job that others didn’t have making them more competitive and better qualified to be successful fire fighters on the job,” shares Honolulu CC FIRE instructor, Chief Richard S. Rhode. FIRE students learn to function as integral members of a firefighting team as well as earn five certificates in: CPR, Emergency Medical Service-First Responder or EMT-Basic, Hazardous Materials Awareness and Operations and Firefighter-1. Many of these recruits have applied to Fire Service organizations, both locally and nationally. The FIRE Program provides students with entry level skills or in-service professional development preparing students for jobs in the Fire Service field, such as: fire inspector, fire investigator, insurance adjuster, and safety and building inspector. Successful graduates from the Honolulu CC FIRE Program include instructor, Richard S. (Scotty) Rhode, fire chief at Sasebo Navy Base in Japan; Kenneth Silva, fire chief of the Honolulu Fire Department; Glenn deLaura, fire chief-Federal Fire Department on O‘ahu; and retired fire chief of the Honolulu Fire Department, Attilio Leonardi. Honolulu CC is the first community college in the University of Hawai’i System to offer an associate in applied science degree in fire science. For more than 90 years, Honolulu Community College has been serving the community as a comprehensive community college in the heart of Honolulu meeting the post-secondary educational needs of individuals, businesses, and the community. Honolulu has been continuously and fully accredited since 1970 by the Accrediting Commission for Community and Junior Colleges, Western Association of Schools and Colleges. For more information visit honolulu.hawaii.edu.